Forthcoming 3DS brawlerHyrule Warriors Legends has been blessed with another new trailer, this time showcasing the evil Ganondorf's Trident weapon. The footage shows some of the new attack combos available to the malevolent character, as well as the destructive power of the weapon itself. Hyrule Warriors Legends launches in Japan on January 21st 2016, with the North American and European releases coming on March 25th. Awesome. Ganondorf desperately needed more weapons. I'm mostly glad to see it can be transferred to the Wii U. Looking forward to all of that more than I am the game itself. do we know if anything other than characters/weapons transfer across e.g. the Wind Waker and Lingle (refuse to use the K lol) chapters? Anyway, if someone finds the Hyrule Warriors Legends Limited Edition with that golden compass comes up for preorder on any Amazon EU please @Splatburst me. as far as i see no e.g. they've announced that linkle's story would be 3ds exclusive. @Dsssdds The cutscenes shown in the Direct were definitely HD, so I'm expecting that on the U.
I'm digging Ganondorf's new weapon, although it's nowhere near as cool as his dual swords to me. Maybe seeing the U version of it will close the gap a little. Please, tell me the Wii U version of those characters can be purchased without the 3DS game. cool nice to see him get Ganons wepon Althow he reminds me even more of Lubo now lol. 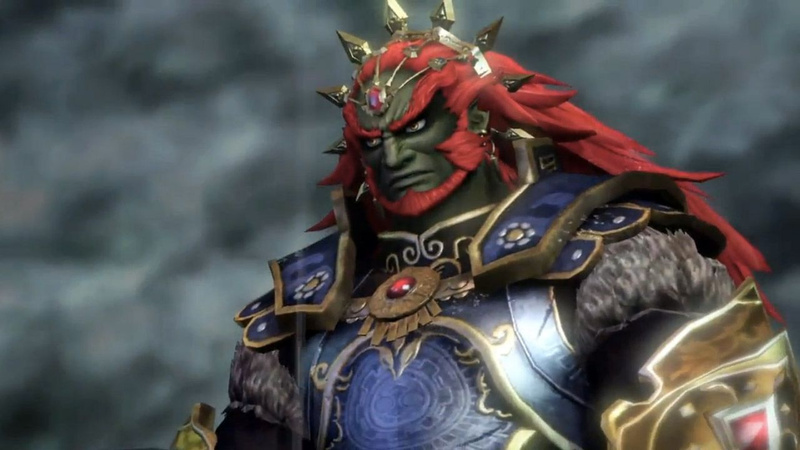 Ganondorf is the only Nintendo villain I find scary. It's good to see him looking ferocious in that video. Anyone notice the way he throws his trident in a circle around him, like in ALTTP? This is the one weapon i was missing in the game. Ganondorf is my main character, and while the two swords are awesome, i always miss the trident. Great to see them add this! I cna only hope that all the stuff they add to the 3DS game, also gets added to the WiiU version, but thats wishing for to much i guess. It's the boomerang fork! I've missed you! Wasn't interested in this on Wii U, but for all the extra stuff for the 3DS version (and the fact it's portable) sign me up! Can't wait to play as Ganondorf. Looking forward to this on the Wii U. Haven't played in so long but I wouldn't mind going back. Wii U gets this DLC, TP HD, Pokken Tournament and Starfox Zero, winter/spring is looking so much better for Wii U than the holidays. Then SMTxE. Still not holding my breath on the nameless timeless Zelda. Even if it is out on Wii U, if NX gets a superior version will probably just play it on NX. 2 player couch co-op on 2 Gamepads w/ Link and Linkle? I don't honestly think Nintendo would make a "superior" Zelda u. If anything it be just a port. Twilight princess didn't have anything special on the wii and. The original version was deemed superior. Well maybe superior was the wrong word, bu tWii vrison did have Wiimot eplay with motion. And if NX has 2 player with 2 Gamepads that would be the superior version for my family, no doubt. Ganondorf is looking awesome the favourite bad guy we love too hate lol. @rjejr You can't really call Twilight Princess' Wii control scheme a "motion" play. You just swinged the Wiimote whatever way you wanted, and the sword still acted depending on your pressed buttons (if camera centered, or if UP-stick), and not on how you swinged the Wiimote. It just felt bad, even the fishing with Wiimote wasn't accurate at all. I never understood the fuss around it, I preferred a thousand times the GameCube version. None knows anything yet about Zelda for Wii U, but it's easy to predict they won't include a real multiplayer portion, if they even try to add it at all. So, only point of having a "superior" NX version would be... 4K resolution, at 60 fps? I think they'll save that for the NX2. But if you were talking about Hyrule Warriors for NX, well, I'd like to see that, too. Maybe they could even add a Coliseum Mode, with 1 on 1 mode, where each player can only see what they're doing through their own Gamepad. Oh, wait. So there's not only extra characters, but also extra weapons! I hope these are still coming to the Wii u version, though I doubt it. Tecmo wants us to buy the 3DS version, and then transfer the stuff to the Wii u version. Ok guys alot of people are confused about this so let me explain. The Ganondorf weapon as well as the 5 currently announced charecters can only be added to the WiiU version if you have the 3ds version. Yes its cheap, and it pisses me off that i spent $30 on dlc that the 3ds version gets for free, as well as more charecters that the wiiu version can only get through buying the 3ds version. So ya I mean that 1 Original Link costume wont make up for the $30 i lost. I say we should atleast get the new charecters and storymode and weapons if we bought all the released DLC. That seems fair enough. That new weapon is not very inspired.. Ahh.. Ganondorf in that game looks so good. Ssb's Ganondorf is so dull and badly representing him, it's painful. @rjejr it's a cool idea no lie but I don't think there will be a 2 player main zelda game ._. @patbacknitro17 exactly!!! If not I see why their own warriors games aren't popular. Hyrule warriors would be the first and last warriors game I will ever support. Heck wii u should get all this for free. Sweet. I hope this means we'll get a classic Ganon skin. Can someone Email this to Sakurai? @Lady_rosalina "2 player main zelda game "
I don't now, Linkle looked kinda cute, and they are taking freakin forever to even give us any new info about the game, not even the name. Maybe the name gives the co-op away? After SKyrim, The Woitcher 3 adn XCX do we really need another single player open world fantasy game? Wouldn t2 player make it more unique? OK, I'm just messin' w/ you, they can't even get 1 player out of the door, how could they handle 2? Would be a good seling point for NX though. We knew about Yoshis Woolly World for 2 1/2 years before it came out and I'm pretty sure we only found out about 2 player co-op about 6 moths before release. So I guess its possible?